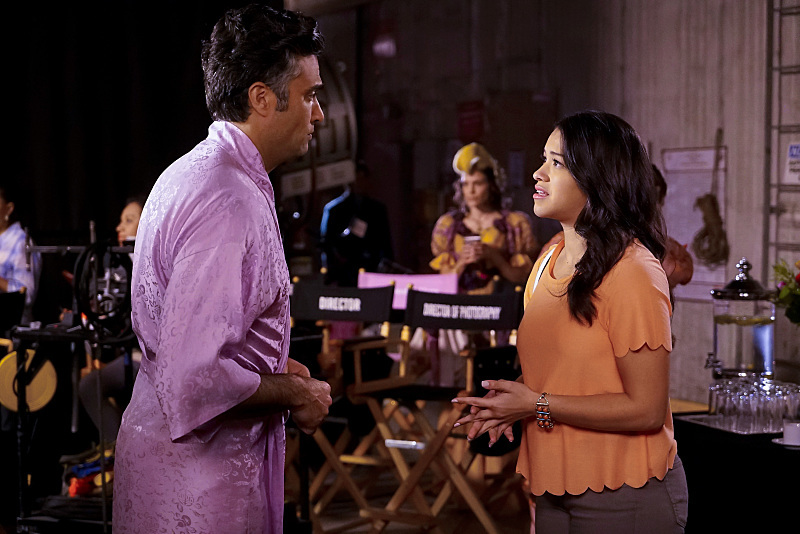 Sometimes Jane the Virgin is hard to watch – not in a bad way. I mean that in more of a “too much secondhand embarrassment to feel in the span of an hour” way. That’s not a new concept for Jane, which has had its share of embarrassing moments for the characters throughout the series. It’s that this episode felt a little more cringe-worthy in a new way for Jane as she tries to flirt with her writing advisor, played by Adam Rodriguez. It’s an accomplishment that Jane the Virgin can be an embarrassment of riches and rich in embarrassment all at the same time. “Chapter Thirty-Three” is the return to form I have been hoping for the past few weeks. Relationships are tested, an interesting development in the rather tame MUTTER case is discovered, and Jane is ultimately left rethinking the vow she made when she was 10 years old. I want to tackle the last one first, since it’s been in the back of my mind throughout most of the second season. How much longer will Jane remain a virgin? (This is the only show where it’s remotely okay to ask this kind of question, by the way.) She’s a mother now and has her share of love interests. As this episode shows, Jane is human. She’s madly attracted to her writing advisor, and watching her try to flirt with him was hilarious. In the end, Jane is Jane, and she honestly comes forward with her feelings and says she’ll look for a new advisor. (Never stop being so responsible, Jane. It’s one of your most valuable qualities.) It then leads to her (now) former advisor asking her out on a date. With a steamy new love interest in the mix, Jane can’t help but rethink the chastity vow she made as kid. Besides the title, will breaking the vow ruin the show? If the writer’s know what they’re doing, no, it should definitely not. There is a lesson to be learned here, and if the series hasn’t proved it already, I trust them to handle it with incredible nuance and emotion – without a trace of judgement or shame. While Jane keeps fantasizing about her advisor, there are some major relationship developments between Rafael and Petra and Xiomara and Rogelio. Rafael and Petra have a business to run, and now that they are being rather friendly with each other, they work together to keep the Marbella from going bankrupt. The past couple episodes provided much needed depth to their relationship. Petra was often painted as a villain, but now we can better understand her motives and see just how deeply her mother has manipulated her. She showed much progress as a character when she rejected Rafael’s kiss, not wanting to get involved with him if he’s still not over Jane. As for Rogelio and Xiomara, they hit a bump in the road. After much trouble and Mateo accidentally swallowing a diamond (and then pooping it out), Rogelio proposes to Xiomara. With his proposal, he tells her that he wants more kids and a family life with her. As the episode illustrates, Xo wants to make her career happen. Her dreams of becoming a professional singer are getting closer and having a family with Rogelio would only get in the way of that. So, that’s what she tells him, and the two are in a bit of a relationship limbo, while they try to sort out their priorities. The MUTTER investigation is heating up. We find out that Sin Rostro is Mutter’s daughter. That means Sin Rostro is also Rafael’s half sister. I hope this gets even more complicated. It looks like the two crime lords are teaming up to get that data chip from Michael. Speaking of Michael, we saw way too little of him in this episode, but he does look surprised at the end of the episode when the investigative team starts looking at the information on the chip. I can only wonder what bombshells that will lead to in the rest of the season. Who is one of the faces in the data chip? I bet it’s Michael’s boss!